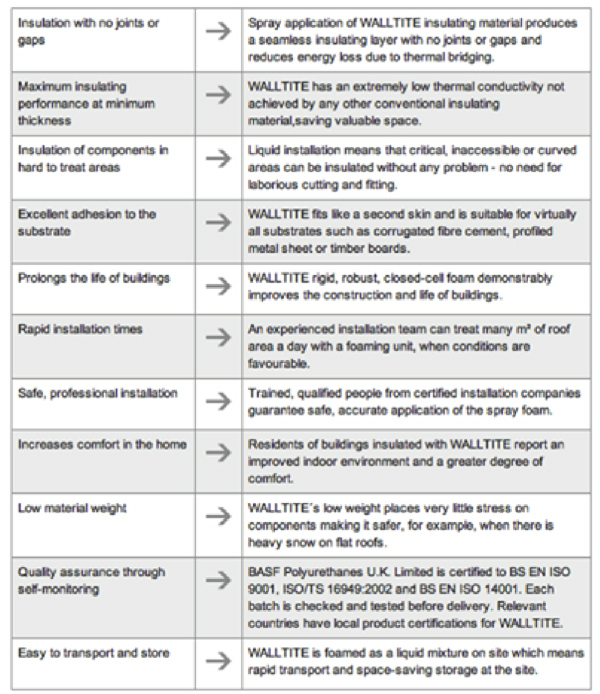 WALLTITE spray foam insulation is manufactured BASF, the world’s leading chemical company and largest producer of spray foam materials. Spray foam insulation when installed expands to completely fill all voids in walls and roof areas while tightly adhering to structural timbers. Spray foam insulation creates a sealed thermal and airtight barrier around the building envelope. This airtight barrier eliminates heat loss and creates an improved building which is comfortable, safe, energy efficient and an overall healthier indoor environment. Unlike conventional insulations spray foam insulation provides a seamless air barrier that conforms to irregular shapes and slopes and allows easy detailing around penetrations such as plumbing and electrical works. The continuous spray leaves a minimal amount of surface without insulation resealing in an airtight building envelope of low permeability. Spray foam offers the specifier an all in one solution to meet and exceed requirement for Building Regulations.